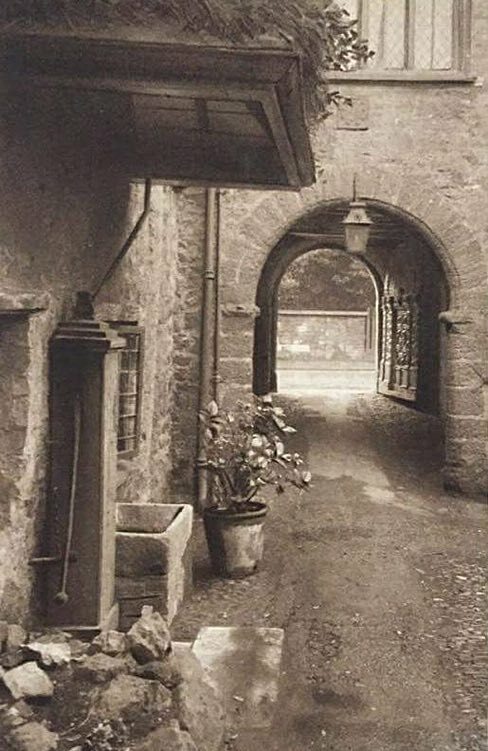 The doorway to the courtyard of the Deanery, 10 Cathedral Close has been drawn countless times by artists, photographed by many, and reproduced on a hundred different post cards. The studded door made of Devon oak has a small postern door to allow pedestrian access, without having to swing the heavy weight of the main door open. 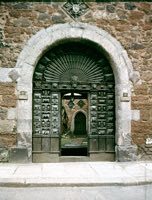 It is one of a series of decorative oak doors in Exeter, including one at the Guildhall, made around about 1600. Over the archway can be found the coat of arms of Bishop Cotton (1598-1621). The black and white gabled facade facing the Cathedral was restored in the 19th Century. The oldest parts of the building dates from the 14th century, but later alterations were made in the 16th, 17th and 19th centuries. One room contains a carved ceiling, bearing the arms of the Courtenay family, the historian Hake, Bishops Fox, Lacey and Oldham, and Lady Margaret Beaufort. There is a Jacobean plaster 'barrelled' ceiling in the Chapel. The building has been in the possession of the Cathedral authorities for its entire life. It has been the residence of the chancellor of the Cathedral. 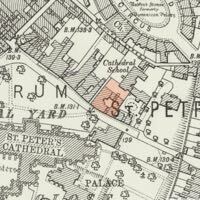 The Treasurer and the Chief Verger were also based in the building. In the middle of the 19th Century, John Gendall the artist, who owned Mols Coffee House as a gallery, lived at 10 Cathedral Close. 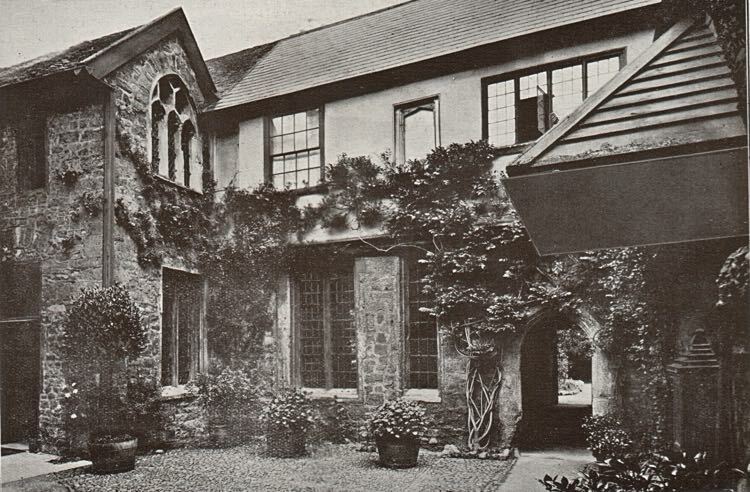 During the twentieth-century it was the residence of the Lord Bishop of Crediton. One Bishop of Crediton, the Right Rev Robert Edward Trefusis, 1897 to 1930, lost his two sons, Captain Arthur Owen Trefusis and Captain Haworth Walter Trefusis on the 7 July and 7 November 1916 respectively, in the First World War. 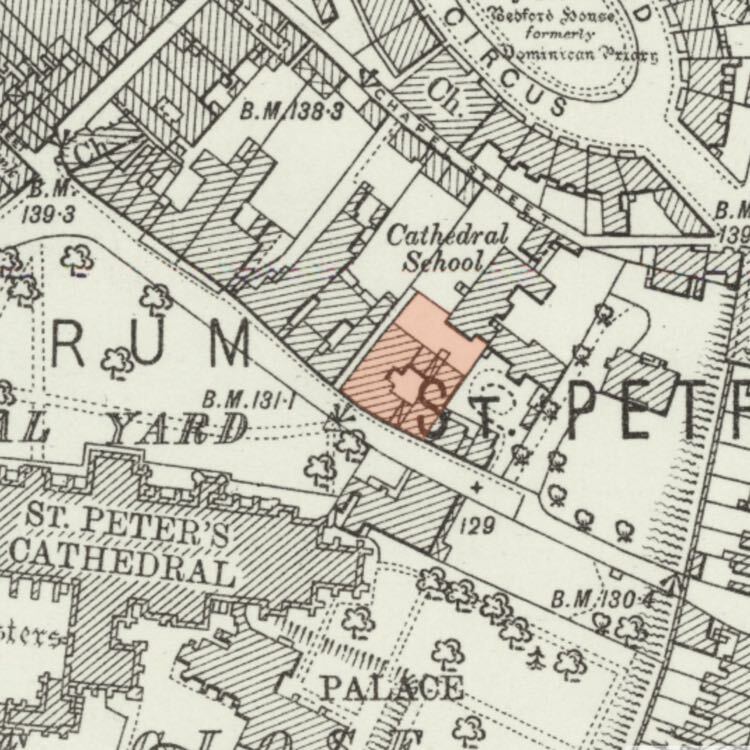 During the blitz of May 1942, the building sustained some damage–however, 11 Cathedral Close, next door, was almost totally destroyed. 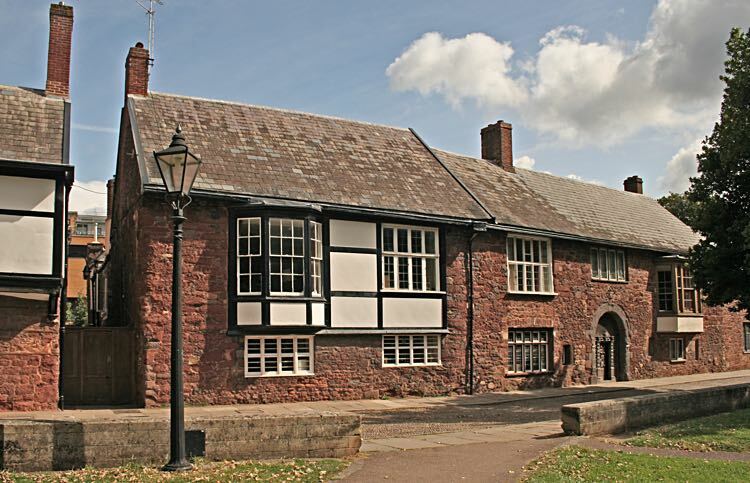 The building is occupied by the Dean of Exeter, who in 2009 was the Rev Canon Jonathan Meyrick. 'Johnny' Dean, as he was referred to, and who had acquired a reputation for liking 'rock and roll'. He also gave a weekly video thought on the Express and Echo website. In 2009 repairs were carried out on the building when stonemasons carried out works of conservation and repair to the facade. Areas of wood rot were also repaired. The building was listed Grade I on the 29 January 1953. Sources: Various trade directories, Exeter City Guide Books, Exeter Architecture by Hugh Meller. No 10 Cathedral Yard, on the right, from the Green. The oak door dates from circa 1600. Looking towards Cathedral Close from the courtyard. 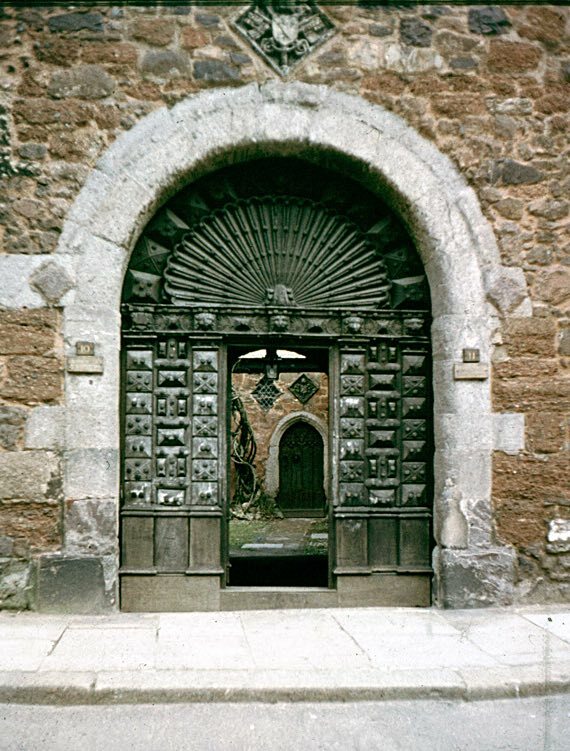 The entrance through the oak door opens up into the courtyard.